For your window replacement project, it is imperative that you consider hiring professionals who can ensure proper window installation. In doing so, you achieve peace of mind knowing that your new windows will perform better and more effectively. The steps leading up to the day of the installation is critical. You first search for the best contractor in your area. Said contractor should not only offer expert installation, but also provide window style choices. After hiring the company, your contractor will schedule a date to install your casement windows. Prior to this, a technical measurement will be set up, wherein one of the professionals will visit your home to accurately measure the opening. Your windows will then be made using these measurements. The contractor’s installation crew will arrive on the scheduled date. With them are the replacement windows and the tools and equipment they need to complete the job. The first step in a window installation is to prepare the work area. The project can be messy, which is why furniture must be moved and drop cloths placed for protection. You can do this in advance, although the crew may also offer to do it if you haven’t. Once everything within the work area is removed or at least covered to protect it from dust or debris, the next step is the removal of your old window. The crew will carefully do so without damaging the opening. The old window is then disposed of properly. After this is the most important step: installing the replacement window. Any gaps are closed for a weathertight seal. The finals steps will be a breeze. The crew will take the time to inspect the newly-installed window to see if it works as intended. Before calling it a day, they will clean up everything and put back all the moved furniture. Your home will look better than when they arrived. 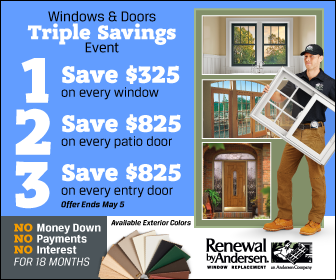 You can experience such excellent service when you hire Renewal by Andersen® of St. Louis as your contractor. Give us a call at (314) 332-2364 to learn more about our energy-efficient windows and our top-notch window installation. You may also fill out our contact form for a free consultation. We serve Missouri residents, including homeowners in St. Charles.